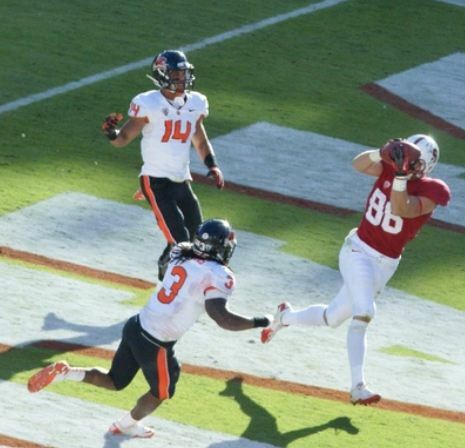 Zach Ertz scores the winning TD against Oregon State. This has been a year of transition for the Stanford Cardinal. For three years the Cardinal was blessed to have Andrew Luck as the starting quarterback. Luck was the #1 overall draft pick in the 2012 NFL draft and this year has been about finding his replacement. Josh Nunes won the job coming out of fall camp and was the starter for the first 9 games and led the team to an 8-1 record. The bad news was that Nunes was completing just over 50% of his passes. Redshirt freshman Kevin Hogan was given a chance against Colorado and looked really good. Stanford coaches felt like Hogan was finally ready to take over. They thought the game against Oregon State was the best time to make a quarterback change, so Hogan was given his chance as the starter against the Oregon State Beavers. The Oregon State Beavers have also gone through some transition at the quarterback position. Sophomore Sean Mannion started the first 4 games and had the team undefeated, but then suffered a knee injury against Washington State. Junior Cody Vaz took over and played well leading the team to two more wins. Once Mannion recovered, he started the Washington game and the Beavers suffered their first loss of the year. Vaz relieved Mannion in the Washington loss and has been the starter ever since. Both teams came into the game with one loss and one game behind the undefeated Oregon Ducks. Oregon State was ranked #11 in the country and Stanford was ranked #14. Both teams have a game left with Oregon, so the winner of this game had the possibility of facing Oregon with a chance at the Pac-12 Championship Game. The Cardinal coaching staff looked like geniuses right off the bat. Hogan, who is a more mobile than Nunes started the game hot and got the team to a 14-0 lead in the 1st quarter. The Beavers responded by going on a 10-0 run in the 2nd quarter, mostly fueled by their running game. Stanford had the best run defense in the country, but the Beavers had good success running the ball. Redshirt freshman Storm Woods had 94 yards rushing for the day on only 15 carries. The Beavers stayed hot, scoring 13 straight points in the 3rd quarter, which game them 23 straight points and a 23-14 lead. Down by 13, the Cardinal again went back to what was successful early in the game. They went back to the running game, allowing Hogan to use play action and bootlegs to move the chains. Cardinal running back Stepfan Taylor scored on a 40 yard catch on a screen play to cut the Beaver lead to 23-21. Then with 9:21 left, Vaz fumbled at his own 25 yard line and Stanford defensive end Josh Mauro recovered. Seven plays later, Hogan connected with tight end Zach Ertz to give the Cardinal a 27-23 lead and they held on for the win. Hogan played really well for a redshirt freshman starting his first game. It’s obvious that he gives Stanford more mobility from the quarterback position. He also completed over 75% of his throws for 254 yards and 3 touchdowns. The real test will be this week. They travel to Eugene, Oregon to take on the #2 ranked Oregon Ducks. The winner should win the North Division of the Pac-12 and face either UCLA or USC in the Pac-12 Championship Game. Stepfan Taylor-RB-Jr: Taylor is not a flashy runner, but he is a very underrated. He has rushed for more than 1,000 yards for 3 straight years. He is a tough runner with deceptive speed. He can stop and start on a dime and he is a very good cutback runner. Taylor had a 1 yard touchdown run and an amazing 40 yard touchdown catch where he ran through the entire defense. He carried the ball 19 times for 114 yards and had 2 catches for 47 yards. His fumble right before the half was a rarity. Ryan Hewitt-FB-Sr: Ryan Hewitt is a versatile player that can do it all for the Stanford offense. He may benefit more than anyone from the quarterback change. He is a very good run blocker, but he also has good hands. He is tough to bring down and fights for extra yards once he gets the ball in his hands. Hewitt is good on screens and meshes well with the quarterback on bootlegs. Against Oregon State he had 4 catches for 52 yards and had a 24 yard catch on a screen. Drew Terrell-WR-Sr: Drew Terrell is a tough receiver with good speed. He is willing to go over the middle, make the tough catch and take the hit. Terrell had 3 catches for 36 yards. Zach Ertz-TE-Jr: Zach Ertz is the key to the Stanford passing game and leads the team in receptions. He is moved all around and can play as an inline tight end or can split out into the slot and go in motion. He has good hands and is a good, dependable target for the young quarterback. Ertz had 9 catches for 75 yards and his touchdown was the game winner. Levine Toilolo-TE-Jr: Levine Toilolo is a big, tall target that is more athletic than he looks. Once he makes the catch, he has the ability to run through tackles. Against Oregon State he had 1 catch for 13 yards. Kalil Wilkes-G-Jr: Kalil Wilkes is one of the keys to the Stanford rushing attack. Stanford likes to pound the ball between the tackles and the blocking of Wilkes allows them to be successful. He has the speed and mobility to get downfield and spring the back for good yardage. Ben Gardner-DE-Jr: Ben Gardner plays defensive end in the Cardinal 3-4 defense. He is a smart player that is not easily fooled. Gardner is an athletic player that closes quickly to the ball. Against the Beavers he had 4 tackles, 1 tackle for loss, 1 sack and a batted pass on 3rd down that led to a field goal. Gardner used his athleticism and football smarts to break up 2 screen passes. Josh Mauro-DE-Sr: Josh Mauro is a reserve defensive end with great quickness. He showed up big in the 4th quarter with a tackle for loss and fumble recovery. Mauro also had 2 tackles against the Beavers. Chase Thomas-OLB-Sr: Chase Thomas was my preseason #2 rated outside linebacker for the 2013 NFL draft. He is an extremely athletic linebacker that gives great effort. Against Oregon State he had a highlight reel play where he went over a running back’s block to bat a pass. He really gets after the quarterback and he brings the wood when he gets there. Thomas had 2 tackles, 1 QB hurry and 1 batted pass. Alex Debniak-OLB-Sr: Alex Debniak is a core special teams player for the Cardinal. He also had a sack in the 4th quarter that took Cody Vaz out of the game. Mannion then had to come on to attempt one pass on 4th down which fell incomplete and gave Stanford the win. Trent Murphy-ILB-Jr: Trent Murphy is a very athletic linebacker. He has the quickness to line up outside and rush the passer from the edge. He puts a hurt on the quarterback when he gets there. Against the Beavers he had 3 tackles, 2 tackles for loss and 1 QB hurry. Shayne Skov-ILB-Sr: Shayne Skov was the team’s leading tackler and emotional leader in 2010. Last year, Skov suffered a knee injury which forced him to miss the last 9 games. He also missed the first game of this year, but has played in the last 9 games. I had him at #5 in my preseason rankings for draft eligible inside linebackers, but he has been slow to recover from the injury. Many players do not complete recover from a knee injury until their second year back, so I look for Skov to have a good rookie season in the NFL. He had 3 tackles and was called for an offsides penalty against the Beavers. Terrence Brown-CB-Jr: Terrence Brown did a good job covering the Oregon State receivers. He had a pass broken up on 3rd and 2 late in the 4th quarter that forced a punt. Brown also supported the run well with 7 tackles. Cody Vaz-QB-Jr: Cody Vaz has been the Beavers starting quarterback for the last 3 games. He had a 3-0 record in starts prior to this game. Vaz is a pocket passer that does a good job protecting the ball. He is comfortable taking direct snaps from the center and looks comfortable on 3 step drops, which might make him a good fit for a team running the west coast offense. He is still learning and sometimes his mechanics get a little bit sloppy. His fumble setup Stanford for the winning touchdown. Vaz is a streaky player that when is on moves the offense very well. Against Stanford he completed 23 of 38 passes for 226 yards and had 1 touchdown pass. Marcus Wheaton-WR-Sr: Marcus Wheaton is a blazing fast receiver that leads the team in receptions and touchdown catches. He is Oregon State’s 4th leading all-time receiver. He has great hands and he comes back well to the ball. Wheaton knows where the chains are and does a good job of staying ahead of them when running his routes. He knows how to get open and can kill you on the underneath routes. He is very athletic and can make the catch even when the ball is thrown behind him. Against Stanford, he had 7 catches for 91 yards and had a 22 yard touchdown catch. Colby Prince-TE-Sr: Colby Prince is a tight end that can help you in the run game and passing game. He is a good blocker with good hands. Prince is a dependable receiver that can be counted on to move the chains on 3rd down. Against Stanford he had 2 catches for 13 yards. Josh Andrews-G-Jr: Josh Andrews is a mobile lineman that pulls and traps well. He threw a key bock on the Terron Ward touchdown run but was also called for a false start later in the game. Rudolph Fifita-DE-Sr: Rudolph Fifita is part of a rotation at defensive end for the Beavers. He is a good pass rusher that is relentless at chasing down the ball. Fifita had a batted ball that turned into an interception. Michael Doctor-OLB-Jr: Michael Doctor is a very athletic outside linebacker. He makes plays all over the field. Doctor is the Beaver’s fastest linebacker and he has the speed to cover tight ends down the field. He is a disciplined player that does a good job reading his keys and staying at home. Against the Cardinal, he had 5 tackles. Feti Taumoepeau-MLB-Sr: Feti Taumoepeau is a two year starter in the middle of the Oregon State defense and is a team leader. He fills the rushing lanes and stops the ball carrier in his tracks. Taumoepeau is also a very good special teams player. Against Stanford, he had 8 tackles and stripped the ball from Zach Ertz. He also stopped Kevin Hogan short of the goal on a 2 point conversion. Jordan Poyer-CB-Sr: Jordan Poyer is the Beaver’s best player. He is a lockdown corner that returns kicks and also plays on special teams. Poyer is a versatile cover man that can cover players in the slot or out wide. He had 5 tackles and 1 tackle for loss. Rashaad Reynolds-CB-Jr: Rashaad Reynolds is a cover corner that plays well on the other side of Poyer. He has good ball skills and plays with good inside position on the receiver. Against Stanford, he had 5 tackles and 1 interception. Anthony Watkins-S-Sr: Anthony Watkins has good speed and has the ability to blitz off the edge. He uses good technique to separate the ball from the receiver. He had a good game against Stanford with 5 tackles, 1 tackle for loss and 1 sack. Watkins also had a fumble recovery in the red zone just before the half that kept the Cardinal from scoring. This entry was posted on November 15, 2012 by draftmaniacs in Scouting reports.